he IBS show is the largest beauty show of its kind to hit New York and they truly are the leaders in eduction and showcasing new products for the beauty professional. The show took place again at the Jacob Javits Convention Center from Sunday March 8th – Tuesday the 10th and expected over 63,000 beauty professionals to pass through their doors to visit over 500 exhibitors. This year a new rule was put into effect, no wheeled luggage bags were allowed on the floor. I remember stumbling over so many of them in past years and wondered why they allowed them at all. I understand how attendees want the rolling bags to carry all the great products they buy, but it is better they check their items in the coat check than try to carry them around the floor of the show. Of course that being said, we were stopped at the main entrance and told we could bring out rolling equipment bags in, but they realized we were members of the press and needed our equipment to cover the show. Exhibitors want beauty professionals to try their products so they can use them in their salons. If they like the products they will of course order more for their use and for resale to their clients. There was so much great product at the show this year, it is a wonder how anyone can truly navigate this show and know what products to try and than buy. Once in, we noticed that some of the exhibitors we covered last year didn’t attend this year, but also noted that many new ones took their place and some were offered a space in the . This is a competitive business that is controlled by the larger companies, but that doesn’t stop some of the young and innovative companies today, who may one day become the hot companies of tomorrow. So we are always on the look out for those that show potential. Not an easy task with the hundreds of exhibitors at this show. Once in, we noticed that some of the exhibitors we covered last year didn’t attend this year, but also noted that many new ones took their place and some were offered a space in the Emerging Brands Pavilion. This is a competitive business that is controlled by the larger companies, but that doesn’t stop some of the young and innovative companies today, who may one day become the hot companies of tomorrow. So we are always on the look out for those that show potential. Not an easy task with the hundreds of exhibitors at this show. We try to cover as much of this show as possible in the one day we spend at the show, but that is truly an impossible task. We we usually start at the IBS Show first and if we still have some time, we try to get over to the International Esthetics, Cosmetics and Spa Show which shares the floor at the Javits Center with the IBS Show. The IECSC (international Esthetics, Cosmetics and Spa Conference is the must attend show for the spa and wellness professional, a growing industry as can be attested to by the shows floor filled with hundreds of companies offering products, services and equipment to the attendees. Last year we spent two days at the show, but this year we simply couldn’t muster our team for two days, so we did our best attending the show on Monday. Andy Peeke our IPA correspondent and on the scene reporter, arrived close to 1 PM on Monday and I spent the morning walking the floor and shooting some of our b roll video footage for our show video myself. I try to highlight the best of what I see at the show which means walking the floors for hours trying to spot some of the hot companies and products and then deciding which ones to interview. We wanted to stop to see the folks at Überliss. Their products are designed for Professional Hair Stylists ONLY and they always have gorgeous models with long flowing hair. We stopped at their booth this year to find out more about this innovative company which was only launched 4 years ago in Sao Paulo, Brazil. On their website they state their mission: “To develop the world’s most advanced formulas whilst utilizing the most cutting-edge methods available in the sciences. We test and improve our formulas on a continuous basis, with the hope of exceeding the needs of professional cosmetologists worldwide.” But what does that really mean? It means they don’t test their products on animals, they only sell their products to professional hair stylists and have refused to sell the drug store chains, QVC’s and supermarkets. If you want to buy their products you must go to a professional hair stylist to get it. Uberliss is a hip company with a handle on social media too and you should visit their social media sites like Instagram. Loads of beautiful models with great hair styles. We were happy to finally get them in our show review and video, long overdue. We shot our interview with Angelika Milonas one of the Überliss executives on the floor who told us a bit more about the company and their amazing three-step Keratin treatment. Check them out and see why this is one of the fastest growing new companies on the scene today. You can see some of their products in our video interview and find out more about their company at their website: http://uberliss.com A must page on the site is their Looks page where you will see stunning models that demonstrate various hair styles. For our male readers visit their 2015 photo gallery, and the others, you won’t be sorry you did. Note: We are producing a 5 minute video with our complete interview of this company, so come back and revisit this page soon. RUSK is always one of the most innovative companies we have worked with. Each year we love to spend some time with Gerard Caruso their Director of Style who fills us in on the hottest new styles. 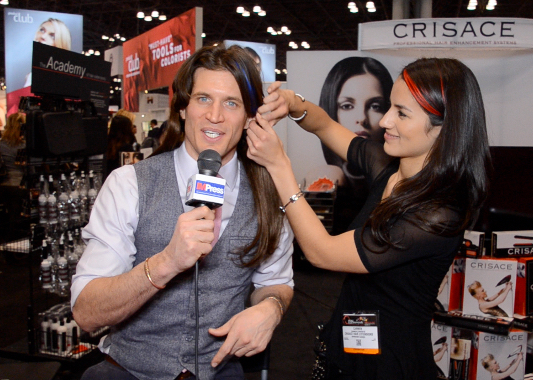 In the video you will see him show us the latest in hair styles and color. Rusk unveiled a new marketing program that provides a wonderful full color, 3D like portfolio of styles and includes a special card that is actually a USB stick that contains step by step directions on how to achieve some of the newest looks using Rusk products. This is one of the leaders in the business and they really know how to market their fabulous products. Be sure to visit their website for loads of tips from experts, complete product list and information and so much more. We love Rusk and use their products in our home, you should too. We met Luis Lajous founder of Beaming White, a company with an innovative and exciting new product at the show. 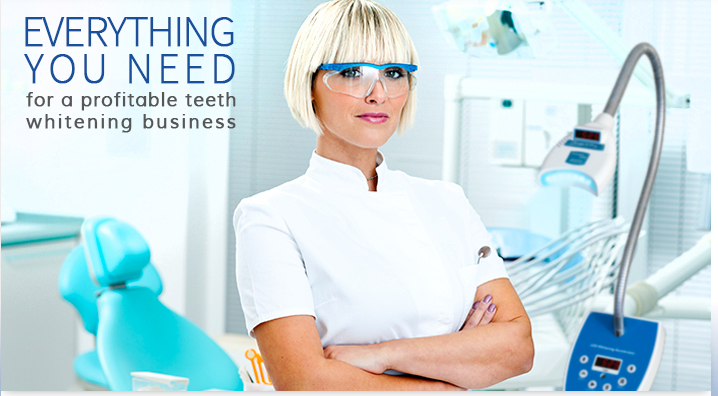 The company is an American teeth whitening manufacturer. They produce just about every teeth whitening product you can imagine, both for professional and home use, right here in the USA. While most teeth whitening companies claim to be manufacturers, they actually are. For that reason, they even welcome business customers to tour their facilities. Their global headquarters and manufacturing facility is located in Vancouver, WA, USA. Their European headquarters are in Barcelona, Spain, and their British headquarters are in the center of London. They also have an additional training center in Manchester. They also maintain a purchasing office and warehouse for parts and components in Shenzhen, China. Now all of us already know that teeth whitening is one of the best ways for salons to cash in on what until now, was a great profit center for dentists. Yes, that profit center is teeth whitening. Today you can visit your better beauty salons and get your teeth whitened in about 30 minutes, while your hair is being colored or drying and save hundreds of dollars too. Beaming White came up with a new twist on this time-tested process. What if they could combine the benefits of light therapy with teeth whitening and use that 30 minutes to achieve two benefits not just one? Well this company did just that. Their other division Cliona Eternal Beauty manufactures and distributes the equipment needed to do both and the customer walks away feeling rejuvenated from the light therapy and has a set of beautiful white teeth and both at a cost that is well, affordable for just about everyone. Their products add a great new revenue stream to the salons and it doesn’t require much training to get one of their salon operators to handle the equipment required for the treatments. Visit their website and watch their videos lots of great info. On Facebook be sure to visit and LIKE their page too! We met and interviewed a number of companies at this show, but alas couldn’t get all of them into our video and article. However we would like to thank Carmen and the nice people at Crisace Professional Hair Enhancement Systems. Andy loves to visit them and last year you can see them put hair extensions in Andy’s hair, see our article and video of the 2014 show. He than walked around asking people if they liked his mullet. This year they put in Blue Bangs and a hair extension and as yo will see in the video, no one seemed to like his new look. You will also met and filmed Chelsea Lynn Miller an Amika Pro Educator for our video. She explains a bit about their unique products and ingredients to Andy, who seems to get a bit confused. Great stuff, nice company and products and from their website… “We create the style, products and packaging; take our own photographs and make our own films. We write our own copy and we do our own marketing, sales, finance and education”, here is a group that does it all. Be sure to visit their website to find out more. Looking good in business means doing more business and I think we all realize the importance of this industry. IBS is simply in the business of helping us all look and feel more beautiful. You don’t have to be vain to want to look your best and we know people who look good feel good too. Although we have thanked all of the companies and people who were kind enough to speak to us at the show, I wanted to do it one more time in this article. Without the support of the companies and the wonderful people we met at this show, it would not have been possible. We hope you enjoy the videos, we feel that if a picture is worth a thousand words our videos just saved us millions of words. Special Thanks to the companies in the photo industry that have supported IPA for many years by sponsoring or donating the equipment we use in our work.